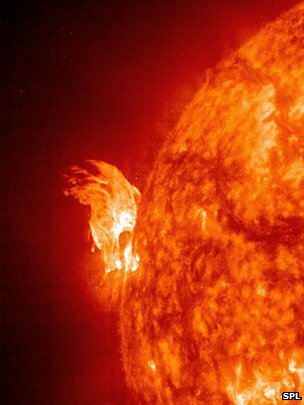 Two satellites have seen “tsunami” spreading on the surface of the Sun after a release of matter into space called a coronal mass ejection (CME). Analysis of the chance sighting, to be published in Solar Physics, allowed the measurement of the magnetic field in “quiet” areas, away from the CME. And thanks to data from Hinode, one of the two satellites, researchers may have cracked a 70-year-old mystery as to why the Sun’s surrounding corona is so much hotter than its surface. Both satellites look at ultraviolet light from the Sun – colours we cannot see but that give hints as to both the chemical makeup and the extreme physical conditions at and near the Sun’s roiling, turbulent surface. David Long of University College London and colleagues finally spotted what are known as EIT waves after a CME. Like a tsunami emanating from the point of a seismic event, EIT waves are shock waves that carry magnetic fields and hot, ionised “plasma”. The SDO satellite was able to capture the ultraviolet light emitted as the wave spread out. From that, the team was able to determine the wave’s speed – some 400km per second – and its rough temperature, over a million degrees. Meanwhile the Hinode satellite returned a high-resolution map of the density of the Sun’s surface every 45 seconds. Using both data sets, the team was able to determine the strength of the magnetic field in the “quiet corona” – a tricky measurement of the Sun in its typical, quiescent state. These CMEs can bathe the Earth with fast-moving particles that can disrupt satellite communications or even knock out electrical power here on Earth – but solar scientists struggle to predict their eventual effects. “Generally we see them when there’s a CME coming straight at us – but when it’s coming straight at us then it’s quite difficult to measure how fast it’s coming at us or how strong it is,” Dr Long said. More observations of EIT waves will be needed to determine the exact relationship between the waves’ and the CMEs’ characteristics. The Hinode satellite was also crucial for measurements reported at this week’s meeting of the Solar Physics Division of the American Astronomical Society. Michael Hahn and Daniel Wolf Savin of Columbia University in New York, US, used Hinode to peer at similar waves from a “polar coronal hole” – a region where, like the pole of a bar magnet, field lines originate and reach far above the Sun’s surface. They were trying to tackle a puzzle about the temperature of the Sun’s surrounding corona. The temperature at the Sun’s core is some 15,000,000C, but its surface is below 6,000C. Yet the corona is known to be at a temperature in excess of 1,000,000C. 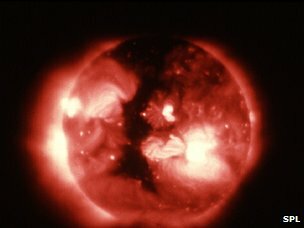 One idea was that waves of magnetic energy rise from below the Sun’s surface, depositing energy into the corona higher up. But what remained unclear was whether the energy was lost on its journey.